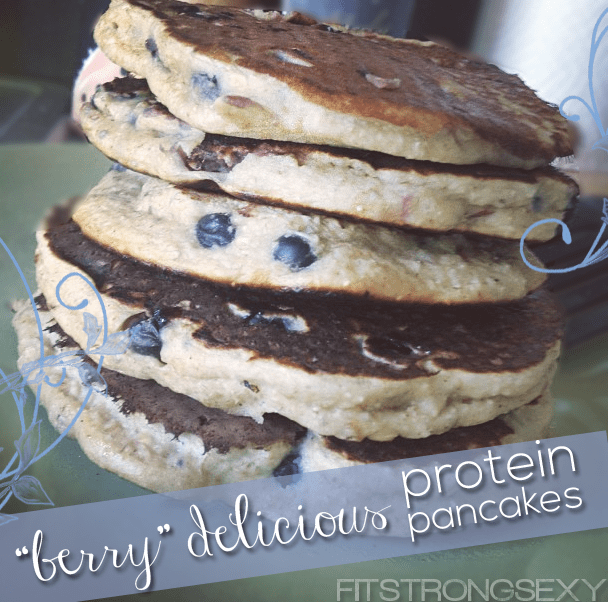 The Best Dang Protein Pancakes…..Period. I love pancakes. No. I REALLY love pancakes. I’ve made countless versions of protein pancakes over the past year, and after many pretty valid interpretations, they were always not *quite* right. Too dry, too thin, too burnt, too runny, etc. I experimented with other people’s recipes, also and learned some basic techniques but still felt the need to embellish. You see, when you stray from boxed pancakes and try to make them healthy and protein packed, you tend to run into more problems than people that just easily resort to Bisquick for their pancake fix. But- ew. Why would you eat Bisquick when you can make these delicious, fluffy, vitamin packed fruity protein pancakes? And in all honestly, I’d rather eat these than any iHop concoction that’s going to make me want to hurl an hour later. 2.) Add the rest of the ingredients EXCEPT berries and peaches and blend. You may have to stir it with a spoon to get it all to move. It takes a few times of blend, stir, blend to get it really creamy as it will turn out to be a pretty thick batter. If it’s just NOT moving- add a little bit more almond milk. But don’t get crazy! Too much almond milk equals a runny, thin batter. And that’s no good. Be sparing with it. 3.) Stir in the berries and peaches. 4.) Spray a nonstick cooking pan or griddle with a tiny bit cooking spray, then cook each pancake at MEDIUM heat. Flip when you start seeing little air bubbles form on the top. The exact timing varies by each stove, just make sure you WATCH them or else they will burn! And that’s it! This recipe yields the exact amount of pancakes you see above, so 5 medium sized pancakes and maybe 6 small ones. My fiance and I split this portion. As you can see, they are pretty thick and fluffy so you don’t need TOO many. They’re great to refrigerate and heat up again. Okay, so what about SYRUP? I like to pair these with a bit of scrambled eggs with veggies and a nice cup of black coffee. Perfect breakfast with protein, complex carbs, and healthy fats to get you through the day! COMMENT and let me know if you tried them, or tweet at me at @FitStrongSexy! Don’t forget- I also have a FB page which you can check out here. “Like” me to keep in touch there as well!